Arch Dam: Its Types, Advantages, Disadvantages. 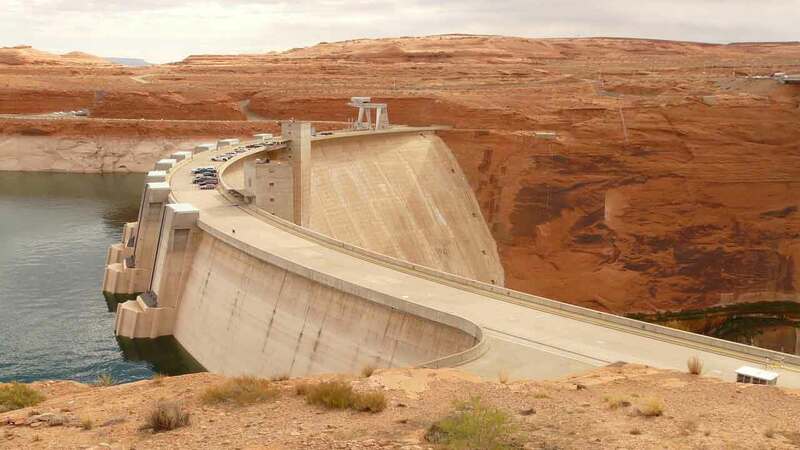 In this article, your are going to learn that what is an arch dam, its types, advantages, and disadvantages in details. 1. 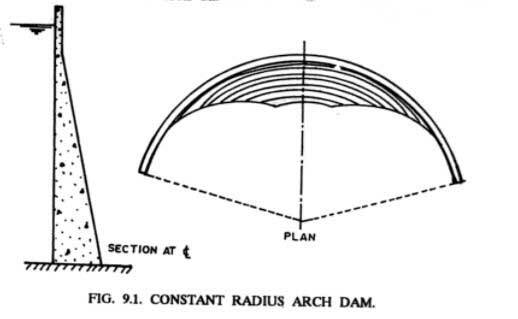 Constant radius arch dam. 2. 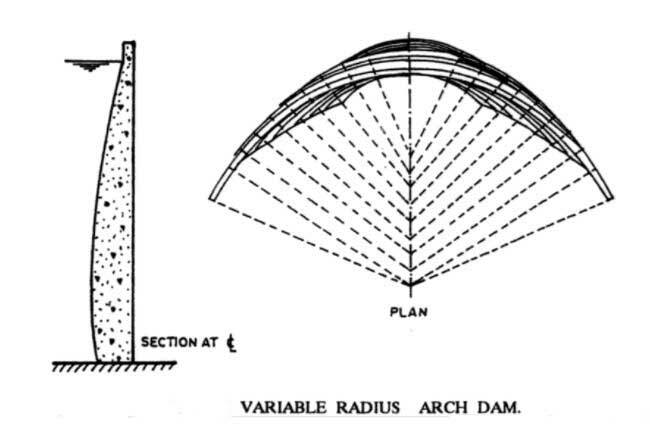 Variable radius arch dam. 3. Constant angle arch dams. An arch dam is a dam curved in plan and carries at major part of its water load horizontally to the abutments by arch action. This part of water load depends primarily upon the amount of curvature. The balance of the water load is transferred to the foundation by cantilever action. The thrust developed by the water load carried by arch action essentially requires strong side walls of the canyon to resist the arch forces. The weight of arch dams is not counted on to assist materially in the resistance of external loads. For this reason, uplift on the base is not an important design factor. Many early arch dams were built of rubble, ashlar masonry, etc. However, practically all arch dams constructed during recent years have been built of concrete. and Base thickness 201 m (660 ft). 1. Arch dams are particularly adapted to the gorges where the length is small in proportion to the height. 2. For a given height, the section of an arch dam is much lesser than a corresponding gravity dam. Hence, an arch dam requires less material and is, therefore, cheaper. 3. Because of much less base width, the problems of uplift pressure are minor. an arch dam can be constructed in moderate foundations where gravity dam requiring sound foundation rock may be unsuitable. Watch the construction video of the largest arch dam in the world. 2. The speed of construction is normally slow. 3. It requires very strong abutments of solid rock capable of resisting arch thrust. Hence, it is not suitable in the locations where strong abutments are not available. Unfortunately, only few sites are suitable for this type of dam. A constant radius arch dam is the one in which the radius to some prominent feature (such as upstream face, or the downstream face, or the arch axis) is constant. In most cases, however, the constant radius refers to the upstream side. that passes through the center of the horizontal arch ring of the upstream face at the crest. Hence, this type of arch dam is also sometimes known as the constant center arch dam. In most of the simple arch types, the upstream face is vertical (i.e., its radius is constant at all elevations), and the thickness is proportional to the height. This makes the central angles of the arch rings of the introdos vary at various elevations, the maximum being at the top of the dam and a certain minimum at the bottom of the dam. 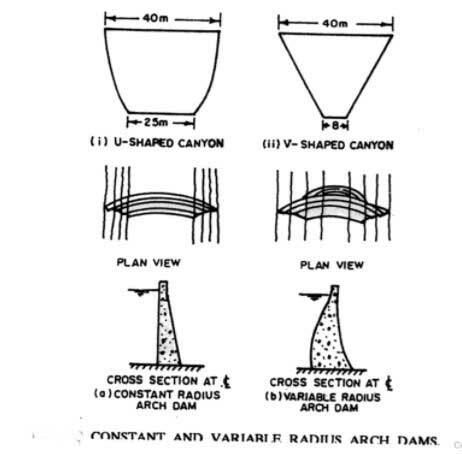 A constant radius arch dam is particularly adopted to U-shaped canyons as cantilever action will carry a large proportion of the load at lower levels. The constant radius arch dams are less economical than the constant angle arch dams, and the latter is constructed in preference to constant radius arch darn. However, the form work for the constant radius arch dam is much simpler to construct. Read More: What is a Surge Tank? Its Types, Definition, Functions, & Principles. and introdos curves (i.e., arch rings corresponding to downstream face) vary at various elevations being maximum at the top and certain minimum at its bottom. This makes the central angle as large as possible so that maximum arch efficiency may be obtained at all elevations. The variable radius arch dams have often vertical or even overhanging laces at the upstream side near the abutments and the downstream side near the crown. The centers of the horizontal arch rings at various elevation do not lie on the single vertical line. Hence, it is also known as variable center arch dam. A variable radius arch dams are often adapted to narrow V-shaped canyons since arch action can be depended upon at the lower levels. A variable radius arch dam has greater arch efficiency, resulting in saving of concrete. Hence, it is preferred in comparison to the constant radius arch dam. The constant angle arch dam is a special type of variable radius arch dam in which the central angle of the horizontal arch rings is of the same magnitude at all elevations. It has been shown that the volume of concrete is minimum when the central angle is 133° 34′. A variable radius arch uses about 58% of the concrete required in constant radius arch dams. A constant angle arch dams requires about 42.6% of the concrete required in constant radius arch dams. Hence, a constant angle arch dam is the most economical. Read More: What is Embankment Dam? Its Types and Components. Thanks for Reading this Article. Please, don’t forget to share it.